President Duterte wants to become the last president under the 1987 Constitution and the first federal government president. 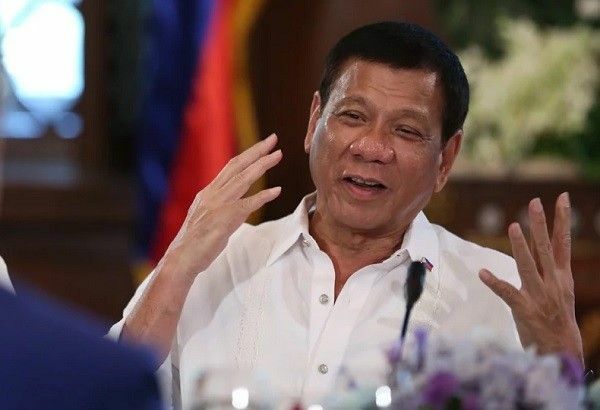 MANILA, Philippines — President Rodrigo Duterte is not barred from running as the head of the transition government under the proposed federal constitution, former Chief Justice Hilario Davide Jr. said on Wednesday. Speaking on ANC's "Headstart," Davide said Duterte would like to be the last president of the unitary government and the first president of the federal system, contrary to his assertions that he would like to retire as early as 2019. He said that the transitional provision of the proposed federal charter did not bar him from seeking to become the transition government head. "This time although a mention of the fact that the incumbent president whose term will end by 30 June 2022 cannot run anymore. What they did was to provide for a transition president, and a transition president is open. There is no prohibition for the incumbent to run as transition president," Davide said during the interview. The federal charter could also pave the way for former Sen. Ferdinand "Bongbong" Marcos to become the vice president as the second highest official should he be elected in tandem with the president under the proposed constitution. This will prepare him for his eventual run for the presidency in 2022, the former chief justice said. The election for the vice presidency would also render Marcos' electoral protest moot and academic, Davide said. Although the transition president and his vice president are barred from running in 2022, Congress could easily modify the draft charter submitted by Duterte's consultative committee to allow Marcos to run as president. Duterte, if he becomes the transition president, would become very powerful under the transition government as he would have full control and powers including the proclamation of martial law which could be declared with an additional ground of lawless violence, the former chief justice said. On speculations that Duterte's State of the Nation Address on Monday would be used to convene the Senate and the House into a constituent assembly which would tackle changes to the 1987 Constitution, the former top magistrate said that this could not be done. "The Senate will object. It will matter a lot. It is an anomalous situation. It is not allowed," he stressed, adding that the Senate should issue its resolution for this to happen. Davide, one of the framers of the 1987 Constitution, also emphasized that the Senate and the House should vote separately on the changes to the charter and not jointly as Speaker Pantaleon Alvarez had been insisting.